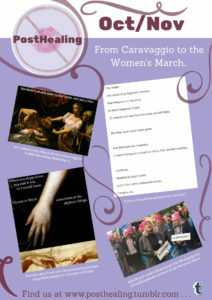 Anonymous submissions and a screenshot from footage of the Women’s March feature in our first compilation from PostHealing. Over the past six weeks, I’ve become more and more aware of the beautiful and awesome resilience of human beings. I’ve been launching PostHealing, the Girl Museum’s new community space for making and sharing art after experiences of violence. Violence is a global issue, affecting staggering numbers of people and far too often shrouded in silence. It is sustained by cultures that do not respond to victims. But we believe that art can help us heal. By sharing our stories, developing creative expression, supporting each other and celebrating our power, we can help ourselves and our world to heal, changing the cultures that sustain violence. At points, launching PostHealing has been overwhelming. To help provide inspiration and illustration for how art can help us, we’ve been sharing examples from around the web and around the world. The sheer volume of examples out there gets overwhelming and in researching artwork, I have had to confront the scale of the problem in a way that feels far more human than any statistic. But I am also inspired. I have been exploring everything from oil paintings to R&B, from contemporaries of Caravaggio to attendants of the Women’s March. Each has confirmed that people have the power to respond to even the worst of experiences with creativity, courage, defiance and optimism. It’s also shown us that everything varies. When it comes to violence, there is no “correct” response. Now that the space is set up, we want to offer it to anyone who might need it. It’s been brilliant to see people starting to engage with our posts and we’ve even been lucky enough to get talking to a few people already. But we would love to get anyone involved who might want to be and to let those using the space shape it. Regardless of your experiences, gender and age, whether you’re an experienced artist or yet to so much as pick up a pencil, you are welcome here. To get things started, we’re going to be hosting monthly zines, collecting together the work that’s been shared and exploring particular themes. With the holiday season well and truly upon us, December’s theme will be family, whatever that may mean to you – good, bad or complicated! Getting involved can be as simple as posting on any social media with #PostHealing. If you’d rather be anonymous, you can use a pseudonym on Tumblr, or send us your submissions at posthealing@girlmuseum.org. So if you’re interested, please do pick up a pencil (or a camera, tablet or ukelele…) and head to www.posthealing.tumblr.com! We’d love to see your response.